No one really thinks about their tires, until something happens. If you have a flat tire due to tire damage, a road hazard, or if you hit an object in the road, you can be left stranded until help arrives. Tires are normally not turned in for claims in comprehensive or collision coverage—for instance, if your tires are slashed—as the cost of a new tire is often less than the comprehensive deductible of your auto insurance policy. When buying tire insurance, you should know this is not a part of your auto insurance policy. 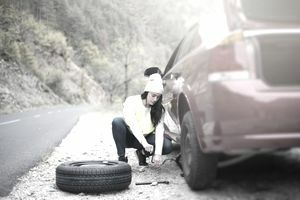 Roadside assistance plans will give you emergency assistance to get your vehicle to a repair shop but do not pay for the tire to be repaired or replaced. Tires can be covered by a manufacturer’s warranty or by purchasing tire road hazard protection. Coverage options, exclusions, and policy limits will vary by protection plan. Most new tires come from the manufacturer with a built-in warranty, but a manufacturer’s warranty has limits. The manufacturer’s warranty covers any defects in workmanship. If the tire is found to be flawed due to a manufacturing defect or material defect, the manufacturer will replace the tire free of charge. Common defects covered by the manufacturer’s warranty include sidewall cracking and block or tread loss. You should be aware that new tire manufacturer’s warranties do not cover punctures from external sources. When you buy a new tire from a tire shop, you will likely be offered a road hazard warranty. A road hazard is something that causes a tire to fail when driving on a maintained road. Examples of road hazards include nail punctures or an impact that causes tire breakage. The cost may come out to $20–$30 per tire on average. If you frequently drive on roads where you see a lot of debris, road hazard protection could make sense for you. Many manufacturers have mileage limits on road hazard protection or limit the coverage to the first full year of ownership. You can buy tire and wheel coverage on a new or used vehicle that will cover damages caused by road hazards such as glass, metal, potholes, debris, etc. In addition to paying for the damage, the policy will also pick up any towing charges for road hazard damage. The policy will pay to repair or replace flat tires and wheels damaged from road hazards. Deductible limits and mileage limitations will vary by plan. Vehicle protection programs or mechanical breakdown insurance (MBI) plans are often offered by a car dealership when you purchase a new car. The program may or may not cover tire and wheel repair or replacement due to a road hazard. You will need to read the contract and have the salesman explain the terms in detail before purchasing a vehicle protection program. Wheel Replacement: Very few warranties/tire policies will cover wheel or rim replacement. The cost of aluminum wheels is high, and many manufacturers will opt to repair rather than replace rims and only offer to replace the rim if the damage is too severe for the tire to hold air when inflated. Alignments: Hitting a large pothole or colliding with other road debris can cause a car to become misaligned. Most road hazard policies or tire insurance plans will not pay for your vehicle to be aligned. Curb Damage: Some plans exclude curb damage. Curbs made out of granite materials, often with sharp corners, can slash through tires. Buying tire insurance in addition to the coverage you already have with a manufacturer’s warranty may or may not be a good idea for you. You will have to weigh the pros and cons and decide if the protection is worth the cost of the coverage for you. Consider what is and isn’t covered as well as the cost. Compare the cost of insurance against the cost of buying a new tire. If road hazard insurance is included for free when purchasing tires, then you should, by all means, take advantage of it. How Much is a Tire Change Going to Cost You?